An epic fantasy, artfully written and illustrated by the author to appeal to a broad audience "...an enchanting read from start to finish" "[Sheldrake's] voicing and vision is brilliant." 16 year-old Azi has grown up in the guild hall of His Majesty's Elite in the peaceful kingdom of Cerion, training hard and dreaming of the day she will finally become a squire and ride out with her parents, both knights, on the King's Quest. Her dream comes true when she earns the right in her sixteenth year, but her name is left off the quest declaration and her parents and their guild ride off without her. When tragedy befalls the Elite on their quest, Azi must band with her best friend Rian, a Mage Apprentice, to discover the source of a mysterious curse. They're joined by an unlikely companion: a colorful fairy named Flit. The fairy clams she is from Kythshire, a mysterious and legendary land of Fae closed off from the outside and cloaked in secrets. Once upon a time, there was a little girl named Missy. She didn't have many friends, so she spent her time quietly singing to herself and exploring the woods in her quiet Connecticut neighborhood. Her parents were a pair that was meant to be, and from them she and her younger brother learned the value of love, hard work, and appreciation for life's small blessings. They spent many hours together floating on the lake, exploring mountain trails, camping, and taking lazy rides along the river on bumpy dirt roads. As she grew older, Missy had her share of trials and difficulties as we all do at times in our lives. The forest was a steady friend for her, and she would find herself escaping into it to listen to the wind in the leaves and feel the quiet strength of the trees. Of course, anyone spending any amount of time in the woods begins to wonder about fairies, and even if they don't admit it to themselves, they might even start to believe. Eventually, Missy went off to college and spent some time learning about the wide world, and finally found true happiness with a paint brush in her hand, telling a story. She dreamed of happiness and tried to spread it around wherever she could. Then one day, Missy met the man of her dreams. True love carried her to Virginia to the suburbs of Washington D.C., where she married her best friend. Together they had a child. The three of them are currently living out their happily ever after together, even as you read this little tale. This book is delightful, so well written, so easy to read, and with a fantastic story line and great characters. 5.0 out of 5 starsI think I'm in love with Fairies! First, I want to say that I'm not a fan of 'fairy tales' and when I started this book, I didn't know what to expect. Now? I want a fairy friend! "Wanna play?" YES! I loved how the author brought the fairies to life, with each having their own personality. 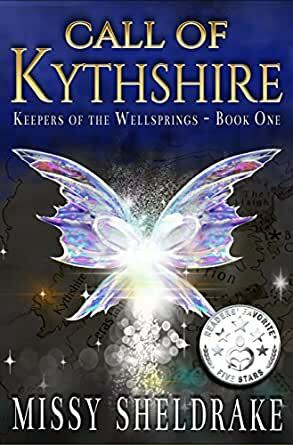 I loved their world, how everything was so different in Kythshire. I think I'm in love with the fairies. That's the only real way to put it. Another thing I found fascinating was how the magic was explained: what it did to the mages if they drew in it too much. The beginning ceremony put me in a good mood for the book. I learned to know Azaeli, and it was fun to read. After that, it seemed to slow a bit. I'm thinking that I may have been too anxious to learn more, because as soon as Flit made her first apparition, it pulled me in. From there, I entered the charming and alluring world of fairies. The plot advanced at a steady pace and soon I discovered the lurking threat along with Azi, Rian, and Flit. I'd recommend not only for fans of fairies and pure fantasy, but also for the world building. Right from the start, I thoroughly enjoyed this book. The action and pacing was great, pulling me immediately into the head of the main character, which was both fun and frustrating. Azi is everything a strong female lead should be. She is headstrong, but not reckless, and has a solid head on her shoulders despite being a fighter. Although this is Azi's story, there are quite a few other characters, all of whom are well written and multidimensional. I had no issue with keeping the names and personalities straight, as can often be a problem with an ensemble cast, especially in fantasy settings. One particular character does try to steal the show. That would be Flit, the fairy who brings new meaning to the term colorful sidekick. The story itself is an original take on the use and abuse of magic. For a light tale, it delves into some intriguing and dark issues. I rather enjoyed the fact that it handled the heavier subject matter without resorting as most fantasy does to the 'dark' or 'adult' realm, keeping the tone appropriate for a younger audience while still being interesting to an older crowd. Also worth noting: the author is also an artist and has added illustrations to the book. While some say they don't add to the experience, I disagree. If anything, it brought me back to the chapter books of my childhood that often had a few illustrations interspersed. I'm glad to see that this tradition carries into the digital age and besides, the illustrations in this book are woks of art. Truly beautiful. I can't wait to see what happens in the next book. This is a well-written story to be enjoyed by all ages. When I took a "Look Inside" this book, I saw beautiful drawings of maps and scenes. I purchased the e-book and was pleasantly surprised to find them included, along with many more. The world building is detailed and colorful. The story played out like a movie in my head. The characters have distinct personalities, including the fairies, which I think are very cute. There's one who likes sugar cubes and often touches Azi's face with her sticky hands. Azi and Rian are the best of friends, but also share something more. They are both courageous, honest, and protective of each other. I like that their families have always been close friends, like family to each other, and they work hard together. If I had read this as a child, I would have concentrated on Azi's bravery and her friendships with the fairies and the Princesses. Reading this as an adult, I also enjoyed reading about the love Azi and Rian have for each other. Though I am very happy with how this story ended, I look forward to reading the next book. The Call of Kythshire contained admirable characters juxtaposed against some really malicious and power hungry characters. Some of the characters reminded me of the current politicians of this world! But Missy Sheldrake gave her readers some interesting and amusing little people to inspire us with a vision of how seriously silly we are to have our current viewpoints. Innocence is not contrasted with experience so much as kindness and giving is contrasted with power hunger and abuse of resources. I look forward to reading the next episode of Mrs. Sheldrake's characters. Azi, a new squire, is anxious to set off on her first quest for the King, but someone is plotting against her and things don't work out the way she hoped or planned. Luckily for her, she has Rian, her friend (and maybe more), and along the way she meets Flitt, a sassy, fun fairy. Where the author really shines is her characterization of the fairies. The way she describes them made them come alive in my imagination. Her voicing and vision for them is brilliant. In fact, my only complaint was having to wait a while before they make their appearance. They were worth the wait though. The author has also included quite a few whimsical illustrations that add to the overall experience. Can't wait for book 2!